Shakarkandi (sweet potato) ki kheer is a recipe I don't cook much but whenever I do I make it a point to do it the way I like. Yes I don't eat desserts much but if a dessert has some character that has imprinted in my mind I keep reviving my memories at least every few years if not every season. 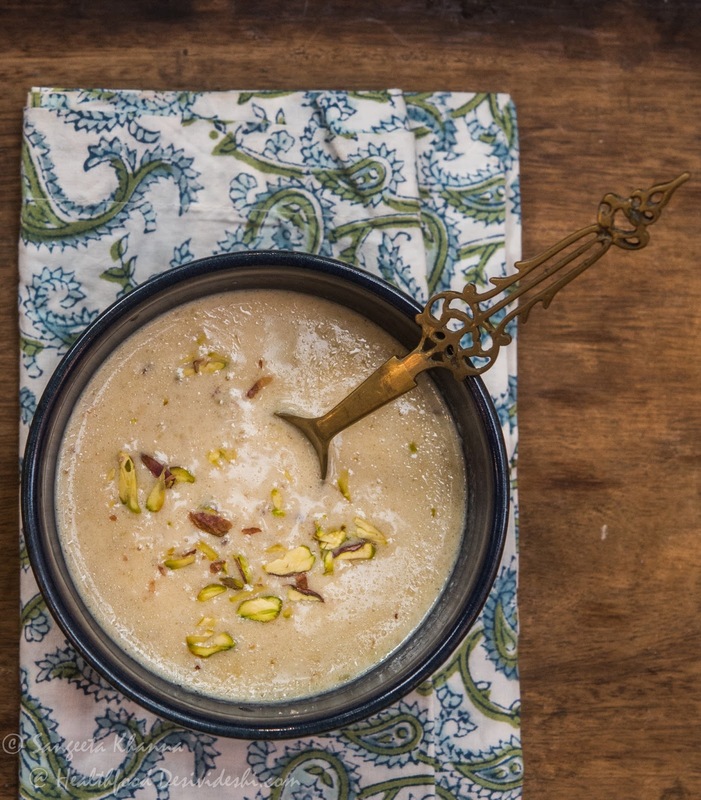 In the case of shakarkandi ki kheer it is the roasted flavour of the shakarkandi that I love and I found a trick many years ago to bring the roasted flavour to the kheer. It is simple and yet makes a world of difference from the regular shakarkandi ki kheer. The shakarkandi ka halwa is not my favourite but shakarkandi ke roth I love since childhood. 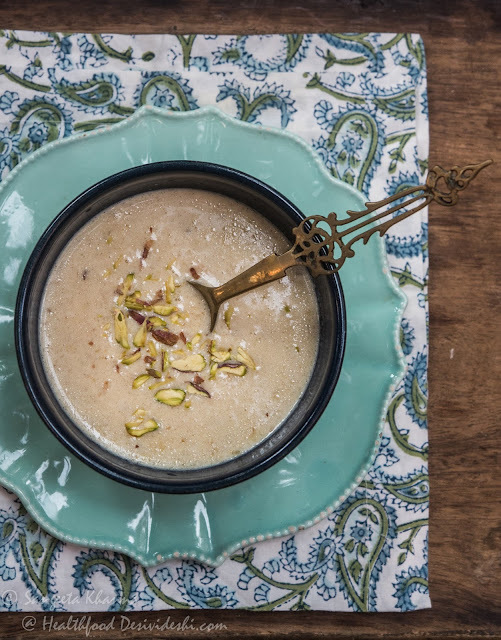 This kheer made of shakarkandi has been much preferred over shakarkandi wali rabdi which is a lighter rabdi, although I don't make desserts everyday. Sweet potato hash browns are my type. Also I prefer desserts that don't use much sugar or use a bit of jaggery and preferably made with sweet fruits or sweet potatoes as in this case. If you reduce milk slowly the subtle sweetness is enough along with the natural sweetness of sweet potatoes in this shakarkandi ki kheer. I suggest you try this recipe without using any sugar and see how the rich multilayered natural sweetness of the ingredients shines through in the absence of sugar. If we add sugar it overpowers the subtle sweetness of milk and sweet potato combined. If you feel like adding sugar you can always keep some thick syrup ready to be added in the last moment. I bet you wont need that if you really like the roasted flavour of the sweet potatoes..
Simmer the milk in a thick base pan till it reduces to about 200 ml. Meanwhile, peel the sweet potato using the thin side of the grater. Place the grated sweet potatoes in another thick base pan, sprinkle with 1 tbsp water, cover and cook on very low heat for about 7-8 minutes or till you get a roasted sweet potato aroma. You will find the grated sweet potato sticking to the bottom of pan and getting reddish brown, that is a desirable step of the recipe as it brings in the much desired flavour. This is the trick to get that roasted sweet potato flavour in the kheer, let it stick to the bottom of the pan in a controlled way and see how it makes a difference. Take care to use a really small pan for such a small quantity as a large pan may alter the cooking time. Using cast iron or anodised Aluminium pan works better. By the time the sweet potatoes are cooked and aromatic the milk will be reduced suitably, add the cooked sweet potato to the reduce milk and let it simmer for a couple of minutes together or till you get a desired consistency. Chill and serve with chopped nuts on top. You will not need any sweetener in this recipe I promise. Do let me know when you make this shakarkandi ki kheer, and whether you liked it. I have seen even kids loving it without realising it is a dessert without sugar. 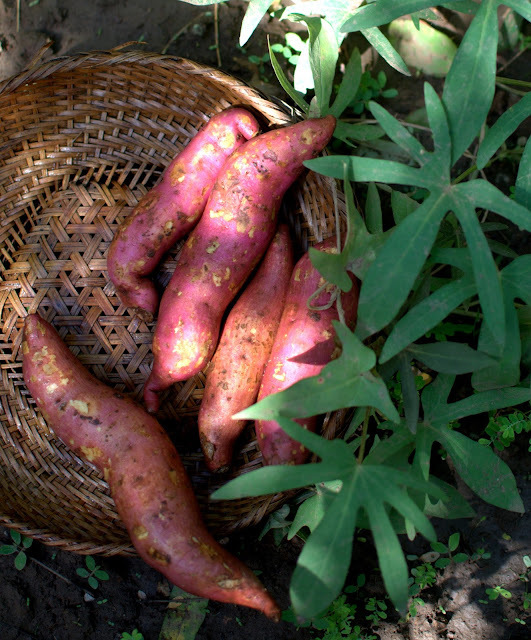 The roasted flavour of the sweet potato is a great help in bringing out the natural sweetness of the ingredients. Caramelisation of the natural sugars in food they say.